Physical therapists work directly with people to enhance movement and foster optimal health and functional ability. Patients/clients include those who have sustained injury or illness, have developmental deficits, have age-related problems, or need preventive care. Physical therapists examine and evaluate patients to determine functional abilities such as walking, work capacity and community activities. They may examine and evaluate strength, sensation, joint mobility, endurance, pain, reflexes and movement skill of patients. They plan therapy programs that may include exercises to improve functional abilities by increasing strength, endurance, balance, coordination and range of motion. Advanced expertise leads to work in administration, consulting, research and education. This graduate program takes three years and begins in the summer. Clinical assignments are often available outside the Syracuse area, and are scheduled during the summer after the first and second years and during the spring semester of the third year. The Professional Doctoral Program is a full-time, three year professional (entry-level) preparation program in physical therapy. The first year begins in the summer, and the program of study includes a minimum of 121 graduate credit hours over three years (including summers). The curriculum includes classroom instruction and clinical work, which may include day, evening and weekend classes. 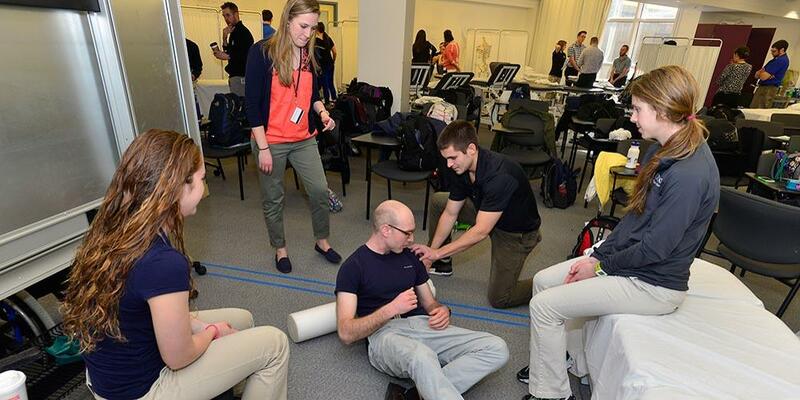 Graduates of this program receive a Doctor of Physical Therapy Degree and are eligible to apply for licensure as physical therapists throughout the United States. All entering students except 3+3 students must hold a bachelor's degree. Early assurance programs are available for high school seniors. The Department of Physical Therapy Education at Upstate Medical University is accredited by the Commission on Accreditation in Physical Therapy Education (CAPTE), 1111 North Fairfax Street, Alexandria, Virginia 22314; telephone: 703-706-3245; email: accreditation@apta.org; website: http://www.capteonline.org. If needing to contact the program/institution directly, please call 315-464-6881 or email PT@upstate.edu.